At this point in George W. Bush's presidency, Hollywood uncorked a barrel of anti-Iraq-war movies, all of them in their varying styles trashing the American military or intelligence agencies as vicious murderers, rapists and all-around freedom-tramplers. Most were duds because the public wanted nothing to do with those messages. But oh, did the critics love 'em. New York Times film critic A.O. Scott has indicted the film as political propaganda: "The politics of the Iraq war are entirely absent, which is a political statement in its own right," he declared. 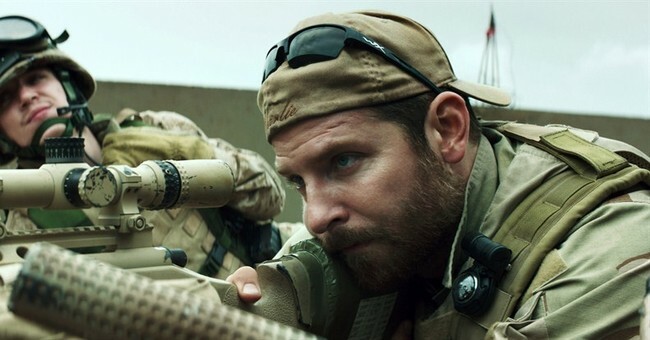 "And though George W. Bush's name is never invoked, 'American Sniper' can be seen as an expression of nostalgia for his Manichaean approach to foreign policy." Scott admits that Eastwood "doesn't flinch from portraying the toll of his (Kyle's) service on his psyche and his marriage, though it may tidy up the damage a bit too quickly and neatly. But this, too, is part of the film's loyalty to its hero's understanding of himself and his work. Or, you might say, its commitment to printing his legend. 'Legend' is one of the nicknames Chris earns from his admiring fellow servicemen, who are in awe of his bravery and skill, and Mr. Eastwood engages in his share of mythmaking." Let's match "Sniper" with "Milk," the 2008 film about assassinated gay San Francisco city councilman Harvey Milk. In this exercise in liberal mythmaking and propaganda, Scott hailed Sean Penn for conveying "Milk's fundamental kindness, a personal virtue that also functions as a political principle." Scott can hail how "Milk had a profound impact on national politics, and his rich afterlife in American culture has affirmed his status as pioneer and martyr." And yet the script "manages to evade many of the traps and compromises of the period biopic with a grace and tenacity worthy of its title character." Facts don't matter one whit. After all, Scott loved "Fahrenheit 911" 10 years ago. He asserted that while Michael Moore's mockumentary would be "properly debated on the basis of its factual claims and cinematic techniques, it should first of all be appreciated as a high-spirited and unruly exercise in democratic self-expression." He honored Moore as "a credit to the Republic."